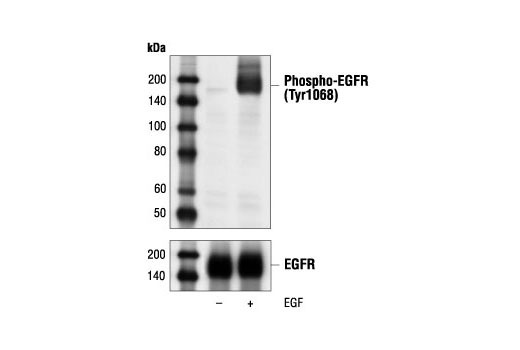 Western blot analysis of extracts from A431 cells, untreated or EGF-stimulated (100 ng/ml for 2 minutes), using Phospho-EGF Receptor (Tyr1068) Antibody #2234 (upper) or EGF Receptor Antibody #2232 (lower). The human EGF coding cDNA was obtained from human periodontal tissue mRNA, subcloned into a prokaryotic expression vector and expressed in E. coli. Epidermal Growth Factor (Human EGF) was purified and stored in PBS buffer containing 0.1% BSA. CST recommends using 50-100 ng/ml of Human EGF for stimulation of Human EGF signaling. Human EGF is supplied as a solution. It should be stored at –80°C. Aliquot the reagent upon receipt and avoid repeat freeze-thaw cycles. Epidermal growth factor (EGF) is a small polypeptide hormone that has mitogenic properties in vivo and in vitro and effects the growth and/or differentiation of many cell types. EGF elicits biologic responses by binding to its cell surface receptor, which is a transmembrane glycoprotein containing a cytoplasmic protein tyrosine kinase (1,2). The binding of EGF to EGF receptor induces dimerization of the receptor, autophosphorylation, and activation of downstream signaling components (3). The integrated biological responses to EGF signaling are pleiotropic, including mitogenesis or apoptosis, enhanced cell motility, protein secretion, and differentiation or dedifferentiation. In addition to being implicated in organ morphogenesis, maintenance and repair, research studies have correlated upregulated EGF receptor signaling with progression to invasion and metastasis in a wide variety of tumors (4-6). Thus, investigator have identified EGF receptor and its downstream signaling molecules as targets for therapeutic interventions in wound repair and cancer (4-6). Wells, A. (1999) Int. J. Biochem. Cell. Biol. 31, 637-643. Boulougouris, P. and Elder, J. (2001) Anticancer Res. 21, 2769-2775. Schlessinger, J. (2002) Cell 110, 669-672. Sarries, C. et al. (2002) Pharmacogenomics 3, 763-780. Lorimer, I.A. (2002) Curr. Cancer Drug Targets 2, 91-102. Ghaneh, P. et al. (2002) J. Hepatobiliary Pancreat. Surg. 9, 1-11.